We’d love your help. Let us know what’s wrong with this preview of Backwards and Forwards by David Ball. This guide to playreading for students and practitioners of both theater and literature complements, rather then contradicts or repeats, traditional methods of literary analysis of scripts. Ball developed his method during his work as Literary Director at the Guthrie Theater, building his guide on the crafts playwrights of every period and style use to make their plays stag This guide to playreading for students and practitioners of both theater and literature complements, rather then contradicts or repeats, traditional methods of literary analysis of scripts. Ball developed his method during his work as Literary Director at the Guthrie Theater, building his guide on the crafts playwrights of every period and style use to make their plays stageworthy. The text is full of tools for students and practitioners to use as they investigate plot, character, theme, exposition, imagery, motivation/obstacle/conflict, theatricality, and the other crucial parts of the superstructure of a play. He includes guides for discovering what the playwright considers the play’s most important elements, thus permitting interpretation based on the foundation of the play rather than its details. To ask other readers questions about Backwards and Forwards, please sign up. It is a bitter joke among my screenwriter friends that the way you get a TV show is that you create a truly interesting character, in a fascinating environment, whose family has complicated, fraught dynamics... "and he solves crimes." It is a cliché among high school drama classes that Hamlet is about a man cursed with indecision. What is up with that guy? If Othello had been in his shoes, he'd have killed off Claudius in Act One, scene 2. (To be fair, if Hamlet had been in Othello's shoes, he'd It is a bitter joke among my screenwriter friends that the way you get a TV show is that you create a truly interesting character, in a fascinating environment, whose family has complicated, fraught dynamics... "and he solves crimes." 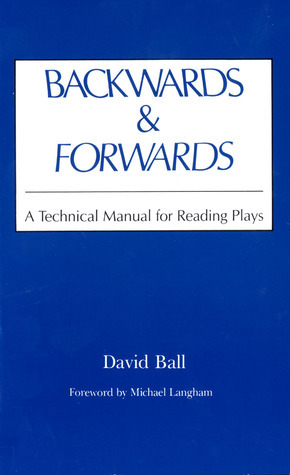 A playwright and perfessor named David Ball has written a really brilliant book on how to read plays called Backwards & Forwards. He makes the interesting point that to understand a play you have to read it, yep, backwards and forwards. Going forwards, anything can happen. Hamlet could find out his mother's married his uncle after his father died mysterious, and bugger off back to Wittenberg U. Hamlet could avoid the poisoned blade. Hamlet could turn out to have ingested small portions of the poison over years to render himself immune to it. But if you notice that (SPOILERS) at the end of the play he offs someone important (HAH NOT REALLY), you can work backwards step by step until you see the train of consequences that gets him there from the Ghost's first speech. Only then can you understand how the play is constructed. And, in doing so, he makes a much more specific point. Hamlet is not at all indecisive -- once he knows that Claudius is guilty of murdering his father in Act Three. Well, you see, in Elizabethan times, if you saw a ghost, you had no way of knowing if it was your father, as it appeared to be, or a vision sent by a witch or a devil. Sure, the ghost says that Claudius murdered him. But maybe he's lying! He is not indecisive. He does not know the facts. He very decisively seeks to get them. Shakespeare is a funny playwright for modern audiences and modern theatre companies. His language is some of the best poetry in English. His plays, however, are not "poetic" at all. They are not "art plays." Their subject matter is always something clear: power, love, money, love vs. money, love vs. power, power vs. power. They have fast-moving plots, with twists and turns. And the damn things are well nigh bulletproof. If you put on a Shakespeare play as is, you have one difficult task: get the actors to understand what the hell it is they're trying to say, and then say it like that is the way they talk. If you can do that, the play will work. It will work in period costumes, it will work in modern dress, it will work with the city guards wearing Victorian bobby helmets, it will work when all the characters are women and Mercutio is mortally wounded with a butter knife. If you can figure out what people are saying, it is not at all hard to figure out what is going on. (E.g. "Now is the winter of our discontent made glorious summer by this sun of York..." = war is over, we Yorkists won, times are good, I hate my life.) Someone will quickly tell you, often three times. Richard III starts his play by telling you that he is a bad, bad man. Romeo & Juliet tells you it's a play about lovers who are, from the first, fucked. On the other hand, if the actors don't know what they're saying, or think they're presenting poetry instead of people trying to get what they want by talking to other people, then it becomes a morass of poetic syllables. Good poetic syllables, very good, very excellent good, and yet they are but so so, because but no one wants to sit through five acts of that. Shakespeare is also a funny playwright because his characters are so much more immediate and straightforward than most fictional characters in the intervening Victorian period, that we forget that he is a man from a different time. When he puts witches in his play, he means witches. They're not a metaphor, they're not (just) a plot device, they're actual witches. Everyone knows witches are real! Likewise his father's ghost is not a plot device, it is a real conundrum (true ghost? devilish vision?) that must be solved before Hamlet can righteously assassinate his uncle, the King. another great and helpful recommendation by Darren Foley. الكتاب مفي another great and helpful recommendation by Darren Foley. Another overdue book from the library. Recommended by 'becoming a dramaturgist' friend Deb, I had to ask my local library to find it somewhere else in the state. By the time I got the book, the time allowed to read, even this slim book, was not adequate. Author David Ball was a professor in the Drama Department at Carnegie Mellon when he wrote this book. He has impeccable credentials since then as well. That being said, I found some of his writing rather juvenile. He refers to those who don't und Another overdue book from the library. Recommended by 'becoming a dramaturgist' friend Deb, I had to ask my local library to find it somewhere else in the state. By the time I got the book, the time allowed to read, even this slim book, was not adequate. Author David Ball was a professor in the Drama Department at Carnegie Mellon when he wrote this book. He has impeccable credentials since then as well. That being said, I found some of his writing rather juvenile. He refers to those who don't understand a play as "dumb readers". Once you get past those types of comments, which are probably meant to draw in the especially educated readers of his book and as a joke, his concept of playreading is fascinating. His primary suggestion is that you cannot understand a play in totality unless you can connect all the dots. Why do things happen and what propels them and he posits that by being able to start at the end and work your way to the beginning of the play you will see those important connections. I stumbled across this book at my local thrift store and decided to give it a go because the summary said it was a guide to playreading that used Hamlet as its primary example. I love the play Hamlet and figured, sure, I could use this book for a reading plan I'm doing in the "book about public speaking" category. With so little expectations, I was surprised at how much I enjoyed this book, it's fantastic. I would highly recommend this book to anyone who wants to get more out of reading plays, st I stumbled across this book at my local thrift store and decided to give it a go because the summary said it was a guide to playreading that used Hamlet as its primary example. I love the play Hamlet and figured, sure, I could use this book for a reading plan I'm doing in the "book about public speaking" category. With so little expectations, I was surprised at how much I enjoyed this book, it's fantastic. I would highly recommend this book to anyone who wants to get more out of reading plays, staging/performing plays, or wants to write their own play. While at first glance this book contains common sense observation, the exploration of those deceptively simple methods leads to some great insight. I disagree with other reviewers who say the book doesn't reveal anything you couldn't get out of a High School English class. I have read countless books on Shakespeare and his plays, and this book (and the methods it details) provided new insights for me. Good read. Here's why I didn't want to give him any money: 1. A lot of what is said should be obvious to anyone who's seen more than like two plays in thier life. I don't want anyone who hasn't had more theater exposure than that to have anything t David Ball has some for real stuff to say about script analysis but most of it is so damn obvious you wonder who would bother to drop $17.95 for it. If it weren't a required textbook. Some of us who didn't want to give him any money found it in library reserves. Although this book was written for actors and directors, I thought it was really insightful for how stories are constructed. Chapter five in particular talks about how people only speak when they want something. I thought this was great advice for any writer. Everything you write has to be because one of the characters wants something from another character. People don't monologue into the "ether." An essential book for storytellers of all stripes, not just for playwrights, directors, and actors. If you're a fiction writer, it'll be useful. You might want to get your hands on Shakespeare's Hamlet while you're reading this, as many examples are drawn from it. I was left dying to reread the play. Might be good for someone just starting out as a director but doesn't offer much to the more established. An excellent analysis of how to read and write drama--very useful indeed. Any writer who specializes in fiction should read this. Playwrights and screenwriters will benefit most from Ball's teachings. As well, anyone who reads, attends, performs in, or produces drama should read this. Not only should it be mandatory reading, readers should also be required to practice the principles Ball provides in specific detail with specific reading assignments and exercises. Le ton de l'auteur est extrêmement condescendant et dégage une prétention sans nom, mais j'ai eu du plaisir à lire cet ouvrage concis et j'y ai appris beaucoup de choses sur la manière dont on raconte de bonnes histoires, sur scène et à l'écrit. Some really interesting points, handy for all forms of story craft (not just playwriting) but unfortunately I found the information was presented in a super mansplain-y way...or at least, rather condescending towards the poor, stupid reader. Read this lil book for a script analysis class. I never know how to rate textbooks but this truly is the perfect and CONCISE go-to for how to read a script. It's got every basic thing you need to know. Big props to the author. Kept losing my train of thought due to lack of interest. Though it might be helpful to others, I feel like I managed to gather only bits and pieces of the book's advice. It did help me review some of the things I've learned throughout college, though. Otherwise, it was not a fun or good read. A lot of common sense advice that comes down to every word of the play being important, and going line by line on how everything connects. So cleverly written! The tone reminds me of Lemony Snicket. It’s the most fun I’ve ever had reading for a class! "A play is not about action nor does it describe action ... A fire is flames. A play is action." I absolutely loved it! Exactly what I expected to acquire from reading it! I'll definitely revisit it every now and then. This is so easy to read and it is thick with valuable information on every page. A useful and concise guide to reading scripts. I would recommend to playwrights, directors, designers, and actors. I could have done without the bitter and sometimes condescending tone. Great book on how to get the most out of plays. Anyone involved in theater should take the time to read this book! "This guide to playreading for students and practitioners of both theater and literature complements, rather than contradicts or repeats, traditional methods of literary analysis of scripts. Ball developed his method during his work as Literary Director at Guthrie Theater, building his guide on the crafts playwrights of every period and style use to make their plays stageworthy. The Great book on how to get the most out of plays. Anyone involved in theater should take the time to read this book! Ball developed his method during his work as Literary Director at Guthrie Theater, building his guide on the crafts playwrights of every period and style use to make their plays stageworthy. The text is full of tools for students and practitioners to use as they investigate plot, character, theme, exposition, imagery, motivation/obstacle/conflict, theatricality, and the other crucial parts of the superstructure of a play.He includes guides for discovering what the playwright considers the plays most important elements, thus permitting interpretation based on the foundation of the play rather than it's details. As an actor, reader of plays, and first time director of a play, I found this to be a really nifty and useful book. It's short, and a really fast, enjoyable read, but it packs a lot in there. There are things you wouldn't really think about concerning plays that he brings up, and things that you really ought to but maybe don't. I'm definitely considering using this manual as a handbook for anything I'm going to act in or direct, and go through some of what seemed to me to be the best advice. He As an actor, reader of plays, and first time director of a play, I found this to be a really nifty and useful book. It's short, and a really fast, enjoyable read, but it packs a lot in there. There are things you wouldn't really think about concerning plays that he brings up, and things that you really ought to but maybe don't. I'm definitely considering using this manual as a handbook for anything I'm going to act in or direct, and go through some of what seemed to me to be the best advice. He uses fun examples and focuses on Hamlet, a text that everyone is (or should be) familiar with, so it's easy to follow along. I particularly liked anything he said addressing characters. For instance, people have a reason for voicing outloud anything that they say. So what is the reason why your character chooses to say this particular thing out loud? I could also see this book being useful for playwrights, and would recommend it for anyone involved in any aspect of the theatre, or anyone taking a theatre class or studying plays. A friend who has studied screenwriting gave me this book when she heard that I had unexpectedly been tasked with writing a screenplay for my memoir. The book is actually intended for people trying to get the most out of an existing script (with Hamlet being used as the primary example), but I found it helpful for my purpose as well. Plus, I've always loved material that analyzes literature as this one does. I particularly liked the rather simple explanation of how a play begins with a kind of st A friend who has studied screenwriting gave me this book when she heard that I had unexpectedly been tasked with writing a screenplay for my memoir. The book is actually intended for people trying to get the most out of an existing script (with Hamlet being used as the primary example), but I found it helpful for my purpose as well. Plus, I've always loved material that analyzes literature as this one does. This is a great resource: a very quick read that points out things that should be (but in fact aren't always) obvious about how to read a play. I think it should be required reading for every actor, director, and playwright. My only complaint is that Ball's tone sometimes comes off a bit smug, and I imagine that this could be a turn-off for some readers. Comments along the lines of (paraphrasing here) "any semi-intelligent high school student can easily grasp the play" do not exactly build confid This is a great resource: a very quick read that points out things that should be (but in fact aren't always) obvious about how to read a play. I think it should be required reading for every actor, director, and playwright. I don't ever leave reviews. So, when I do, you know it's bad. If you have ever taken an English class at middle-school level or higher, read a book, or seen a play, you are at the level of this book. However, if you have some masochistic desire to be spoken to condescendingly by a man who clearly believes he has unlocked the Holy Grail of theatre, go ahead. This book is dry, repetitive, simplistic, and dull. There is little he has to offer about Hamlet that hasn't been discussed in a high school c I don't ever leave reviews. So, when I do, you know it's bad. This book is dry, repetitive, simplistic, and dull. There is little he has to offer about Hamlet that hasn't been discussed in a high school class, and his overview of reading and interpreting scripts is bland and written in broad generalizations. This is by far the best book i have read about understanding plays. The problem with most drama critics is that they are not really aware of the dynamics of theatre and they analyse a play as though it were a novel or any other form of literature. And shakespeare, the best of the best, falls prey to these scholars' impractical analyses. David ball has done a tremendous job. A must read for anyone who loves theatre! And yes, even though this a very book but it will take you some time to read it. This is by far the best book i have read about understanding plays. The problem with most drama critics is that they are not really aware of the dynamics of theatre and they analyse a play as though it were a novel or any other form of literature. And shakespeare, the best of the best, falls prey to these scholars' impractical analyses. David ball has done a tremendous job. A must read for anyone who loves theatre! A book directed toward theater practitioners, Backwards & Forwards provides solid methods for delving into and interpreting a script. The first section, especially, is useful as it speaks about cause and effect. Most of Part 2 also provides interesting ways to examine plays in their written form. The third and final section peters out a bit as it is a restatement of information already known to those in the field. To get the most out of this book, have a solid working knowledge of Hamlet, as A book directed toward theater practitioners, Backwards & Forwards provides solid methods for delving into and interpreting a script. The first section, especially, is useful as it speaks about cause and effect. Most of Part 2 also provides interesting ways to examine plays in their written form. The third and final section peters out a bit as it is a restatement of information already known to those in the field.